As a coach, client, as a person and friend, and in every other sense of the words, I’m going to give you three powerful reasons why I ask that because for me that is such a big piece of my coaching puzzle that I help people with. For those of you who don’t know me, I am an online holistic, intuitive confidence coach. I specialize in working with the subconscious mind and energy to really allow you to be able to have the happiest, healthiest, wealthiest, most successful life possible, whatever that might mean for you. Whether that is losing weight, growing in confidence, building an incredible business that’s going to support you and your vision for the future, your family, or your lifestyle. I do this using a variety of things from Rapid Transformational Therapy, a powerful form of hypnotherapy right through to Reiki, Chakredy energy healing, meditations, mindfulness, visualisations, as well as business coaching, life coaching, and health coaching. All together, these combine to create a really powerful and unique experience for those who work with me and for those who are in my community as well because I share a lot of things like this in my community. You can join the hub here! It is in the action of getting you talking about your feelings that allows me to get beneath the stories that are going on for you in your reality. Let’s look at friends and family - out of a coaching role. Asking this question gives me the opportunity to ask how people are really feeling and absolutely, genuinely, authentically listen to what’s going on for them. Out of a coaching context, it’s a really powerful way to allow people to really feel heard and acknowledged, knowing that I am absolutely listening to their answers, their responses, and not thinking about the next thing I’m going to say or predicting what might be going on for them. It allows me to step back from that coaching role and to openly and honestly authentically listen to what’s going on for people in their lives and in their worlds. As a coach, asking these questions gives me a powerful opportunity to really get beneath those stories of the symptoms, of the side-effects that are going on in your world to see whether there’s something deeper in your subconscious and/or energy that’s actually causing that and creating that issue in your reality. 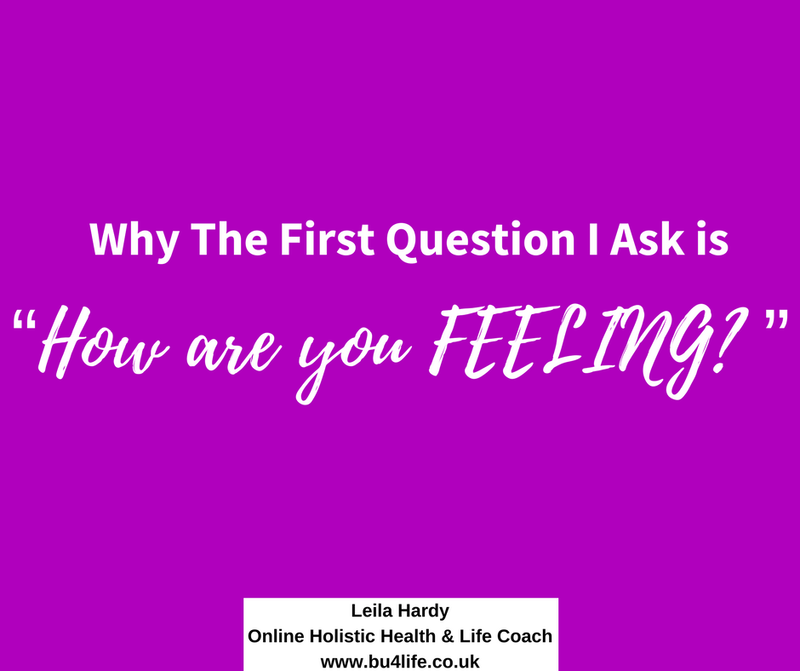 It is a really powerful question to ask, not only to bring you into the present, to bring you back into your body and to connect with yourself, but also for me to be able to really listen beneath the surface and really start, as a coach, to be able to understand what’s going on for you and what subconsciously and energy-wise may also be affecting that result for you. 1. I am an empath, so I feel things. Chances are that if you’re reading this, just by the laws of energy, attraction and the Universe, you probably also feel things in an empathic way or you’re a kinesthetic person; you feel things and that’s your personality type. I literally feel in every sense of the word. So for me to ask that kind of question really opens up my feeling radars to understand what’s going on for you as a person. 2. As a feeling person you may have gotten disconnected from those feelings at some point. You may be stating the facts, you may be stating what’s going on for you, but there is nothing underneath that’s allowing you to connect to why that might be happening. By me asking you that question, “How do you feel? What is that thing making you feel? What are you feeling in this moment?” it’s allowing you to start to connect beneath the surface of the facts and the figures and the stats of what is going on in a particular situation that may be challenging you for any reason with your health, your wealth, your happiness, or your success. It is allowing you to just pause and check in with how that is feeling in your body, in your mind, but also in your energy at a slightly deeper subconscious level as well. 3. I’m a coach. I’m not here to give you answers. I’m not here to give you the solutions. I’m here to create a space and hold you in that space so you can work out those solutions. I’m here to help you out of your own way to give you possibilities, to give you opportunities to be able to see how there may be different ways to do things for you to be able to figure them out. Because there is one surefire thing; when you figure it out for yourself, it’s always going to be the right answer for you in any moment. Whereas if I give you the answers they may not always be the correct ones. a) To connect with people personally at a much deeper level. To really listen and really understand people and what they’re feeling and what’s going on for them. b) If you are in a coaching role or you are mentoring anybody in some kind of way, it gives you that opportunity to really listen to what’s beneath the surface for your client. So tell me, how are you feeling? If you have health, wealth, confidence and happiness challenges going on for you in your life and business and you would love to receive coaching to release them so you can step into your true power and have the health, wealth and happiness you're dreaming of, then let's arrange a time to talk over a Clarity Call-an opportunity for you to see exactly how receiving coaching with a holistic intuitive confidence coach and support you to have, do and be all you desire.